Bishop Amat 72, South Hills 63 — Gjerard Wilson scored 22 points, Bailey Lopez added 21 points and Jarren Ford had 11 points for the Lancers (11-2), who placed fifth at the Covina Christmas Tournament. Jason Rodriguez had 24 points and Dalton Clevenger had 12 points for the Huskies (7-8). Ford earned all-tournament honors. West Covina 69, Kaiser 66 — Nick Hart had 49 points, 12 rebounds, five assists and two blocks and Darian Nickols had 12 points for the Bulldogs (10-6), who placed fifth in the Damien Classic bronze division. Hart earned all-tournament honors. Chino 71, Diamond Ranch 44 — Coree Joseph had 15 points for the Panthers (3-10) in an Orange Holiday Classic loss. Rosemead 39, Northview 22 — Kathleen Pham scored 12 points and Ruby Espinoza, Krystal Espinoza and Amy Ung each had eight points for the Panthers (7-9), who placed third at the Ontario Tournament. Gloria Valdez scored 11 points for the Vikings. Pham earned all-tournament honors. Patriot 55, Wilson 29 — Kendra Ukita had nine points and two rebounds and Hennessy Hernandez had seven rebounds for the Wildcats in an Ontario Winter Classic loss. Glendora 64, La Salle 41 — Alex Lowden scored 23 points and Michelle Can added 21 points for the Tartans in a Glendora Tournament victory Thursday. Rowland 2, Colony 1 — Melanie Romero and Leslie Cortes each scored a goal and Braelynn Lamoca and Melissa Rodriguez each had an assist for the Raiders (7-4-2), who won the Ontario Christian Tournament consolation championship. Alexis Caceres and Ruby Fernandez both earned all-tournament honors. Charter Oak 2, Pomona Catholic 1 — Andrea Jaimes and Bria Salazar each scored a goal and Lori Torres had an assist for the Chargers (9-2-1) in an Ontario Christian Tournament victory Thursday. Damien will face Mater Dei in final: Damien High School basketball coach Mike LeDuc started his 48-team tournament this year because he wanted to provide his team some good competition to prepare it for upcoming Baseline League games.Mission accomplished. 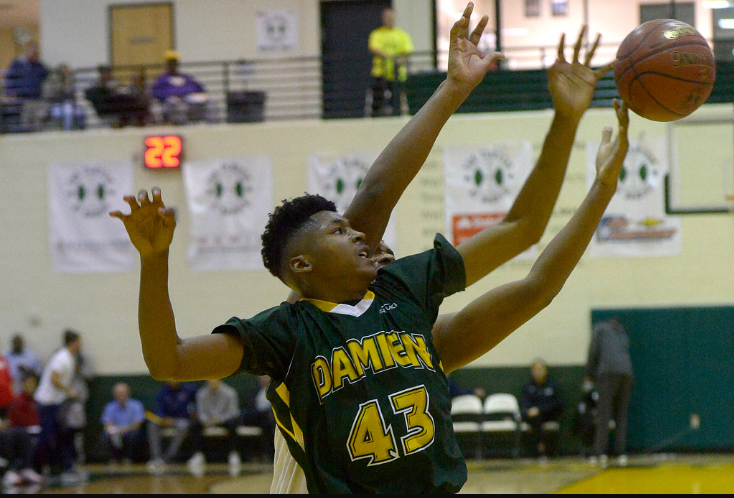 The Spartans advanced to the championship game of The Classic at Damien with a dramatic 62-61 win over Roosevelt on Thursday. Damien (15-0) plays Mater Dei, a 51-49 semifinal winner over Corona Centennial, Friday night at 8:30 p.m.
Watch the final 30 seconds as Damien hangs on for 62-61 victory over Eastvale Roosevelt to advance to Friday’s Gold Division championship at the Classic against either Mater Dei or Corona Centennial. Friday’s game is at 8:30 p.m.
Damien vs. Mater Dei, 8:30 p.m.
Los Altos’ undefeated season ends in Silver semifinals: In several of Los Altos High school boys basketball team’s wins this season, which included two tournament titles, the Conquerors fell behind and found a way to win and stay undefeated. But coach Jeff Lucas knew their good fortune wouldn’t last forever. 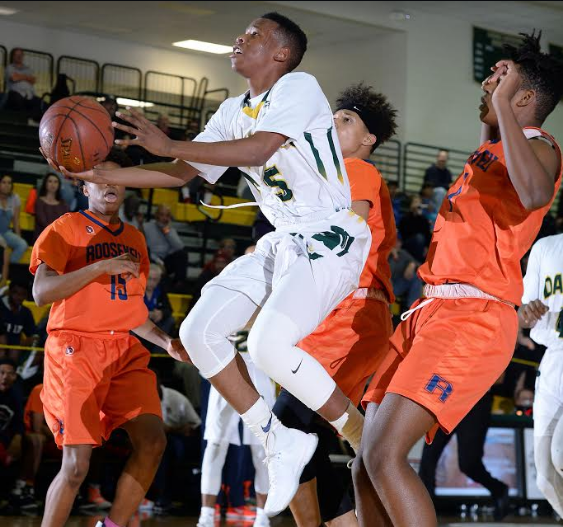 In the Silver Division semifinals of The Classic at Damien High School on Thursday, Los Altos fell behind by 11 points to CIF San Diego Section’s Vista in the third quarter and did what it usually does, rally to tie the game midway through the fourth quarter. Taft vs. Dominguez, 5:30 p.m.
Los Altos vs. Dominguez, third place, 8 p.m.
La Canada vs. Hesperia, 4 p.m.
Three knock-out style tournaments headlines THE CLASSIC at Damien High next week, a Gold Division featuring the best of the best, along with Silver and Bronze Divisions that feature some of the area’s best teams, and solid teams from all over Southern California. Will update scores and schedule each morning. Damien advances to Gold semifinals: The Damien High School boys basketball team had its first big matchup of an anticipated many this season on Tuesday evening. It was a match in more ways than one, too. Long Beach Poly is ranked higher than the Spartans in the CIF Southern Section poll. The Jackrabbits also had a big size advantage. 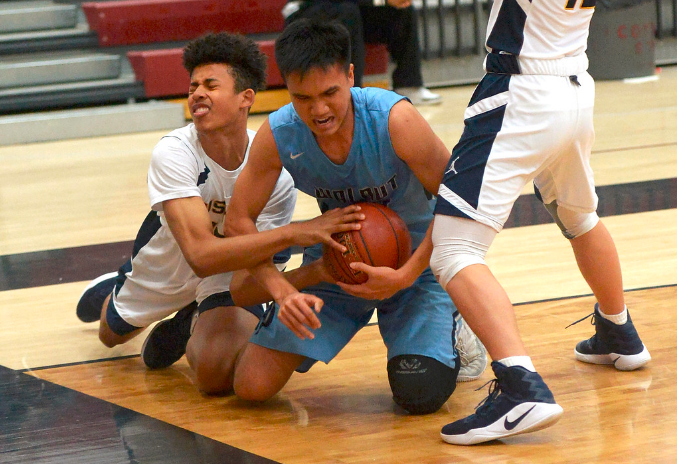 La Salle beats West Covina in Bronze quarters: Size was the strength for the La Salle High School boys basketball team as it wore down, then held off a tenacious West Covina squad, 89-86, in the quarterfinals of the Bronze Division of The Classic at Damien on Tuesday night. The Lancers (7-3) will play the winner of the La Sierra/Hesperia game in the semifinals on Thursday at 6 p.m.
Los Altos opens with Silver Division win: A slow start gave way to a fast finish for the Los Altos High School boys basketball team.The Conquerors trailed by 10 points at halftime before storming back in the second half to defeat Long Beach Jordan, 69-57, in the first round of the Silver Division of the Classic at Damien tournament. 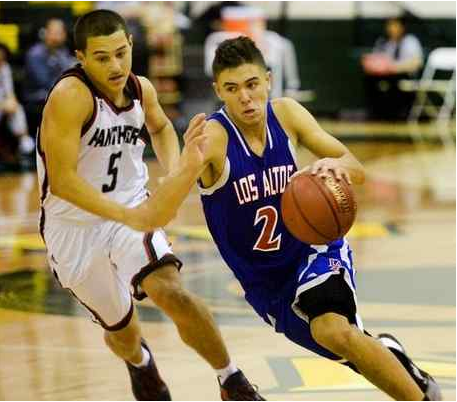 Los Altos (9-0) will play the winner of the St. Bernard-Rancho Cucamonga game in the quarterfinals at 8 p.m. on Tuesday. San Dimas 68, Pomona 34 — Donnell Leffridge scored 15 points and Spencer Bandow added 11 points and had four rebounds for the Saints (8-3) in a Damien Tournament bronze division first-round victory. Also for San Dimas, Elijah Jackson had six assists and Russell Ocampo had five assists. Ivan Richmond had eight points for Pomona. San Dimas will host Diamond Bar today at 4:30 p.m. Final Four is set: The Covina High School girls basketball team overcame a slow start with a strong push in the second quarter to defeat La Serna 62-35 in pool play action of the Glendora tournament on Wednesday night. With the win, Covina advances to the semifinals Thursday night against Chino Hills. Glendora vs. Chino Hills, 7:30 p.m.
St. Francis wins the title: The third time proved to be the charm for the St. Francis High School basketball team. Joey Walsh scored 31 points and Malakhi Jensen had 16 as the Golden Knights won their first tournament in three tries this month with an 85-70 victory over La Serna to take the Nogales tournament title at Nogales High. Charter Oak falls in final: Whittier High School boys basketball coach Chris Dalley said he and his team sat on the bench reflecting on what could have been. The Cardinals handled tough Charter Oak 78-63 in the Wilson tournament championship game on Thursday night. But Dalley said he and his team thought about how they could’ve won two tournament championships this season.He was referring to a 55-51 heartbreaking loss to San Dimas earlier this month in the Glendora Winter Shootout championship. Dalley said the win over Charter Oak was redemption. Walnut finishes third in Covina boys basketball title; J.W. North wins it. COVINA — There will be no local teams in the Covina High School boys basketball tournament championship game, but Walnut made a strong run Wednesday.Cameron Nunley tipped in a putback shot with three seconds left and J.W. North rallied for a 60-58 victory over the Mustangs in the semifinals at Covina High. Walnut (10-5) had a chance to win it, but Eli Ramos’ desperation 3-pointer at the buzzer was wide. North (8-3) will face Cajon, a 72-60 winner over Fremont, in the championship game at 7:30 p.m. on Thursday. Walnut faces Fremont at 6. Mason Westlake led North with 17 points. Ryan Dai had 17 for Walnut. Walnut almost got it done. But North used a 15-8 blitz down the stretch to win. The Huskies trailed most of the second half before putting together an 8-3 surge to take a 51-50 lead on a LaShawn Jackson’ 3-pointer with 3:27 remaining. The teams then traded baskets before Walnut’s Andrew Lee (nine points) drained a 3-pointer with 31 seconds left to tie it at 58. North then ran the clock down to about 10 seconds left when Melvin Walker missed from just inside the free-throw line. Nunley (13 points, 7 rebounds) got the rebound and tipped in an off-balance putback for the 60-58 lead. Ramos took the in-bounds pass before missing his 3-pointer from just inside the half-court line at the buzzer. “(North’s) last possession, we were trying to get it out of their best shooter’s hands,” Khouzam said. “We emphasized blocking out. But they got a lot of size on us and got the tip back. North, getting seven points from Walker and six from Westlake, led 26-25 at halftime. Walnut opened the third quarter with a 10-5 blitz to lead 35-31 before finishing the quarter with a 7-5 run for a 42-38 lead. The Mustangs pushed the advantage to five points twice in the fourth before North rallied. The annual Covina Boys Basketball Christmas knockout tournament starts on Monday. Here’s the schedule, will update scores during the week. 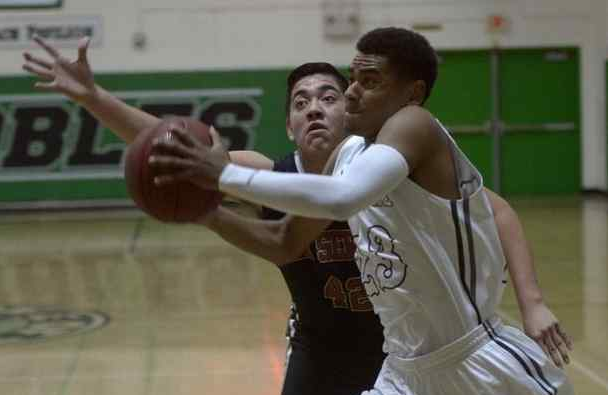 South Hills 78, Mountain View 68 — Jason Rodriguez had 26 points, Justin Acosta had 17 points and Damon Reygadas had 13 points for the Huskies (7-7) in a Covina tournament victory. Also for South Hills, Dalton Clevenger had seven points and 16 rebounds. The Huskies will play Bishop Amat today at 4:30 p.m.
Charter Oak 64, Rowland 61, OT — Jermaine Braddock had 19 points and William Vest and Chase Evans each had 15 points for the Chargers (8-2) in a Wilson tournament victory. Curtis Hong had 23 points and Jarbas Faria had 14 points for the Raiders (9-4). Diamond Ranch 61, Hoover 53 — Coree Joseph had 22 points and six rebounds and Garrett Parker had 12 points and four rebounds for the Panthers (3-9) in an Orange Holiday Classic win. Diamond Ranch will play against Chino today at 10:30 a.m.
Edgewood 81, Southlands Christian 67 — Daniel Felix had 23 points and Niko Yamaoto had 16 points for the Lions (12-2) in a nonleague win. Also for Edgewood, Ozzy Mancilla had 13 points and 16 rebounds and Sebastian Andrade had 10 points. Glendora 73, Montclair 37 — Alex Lowden and Michelle Can each had 14 points for the Tartans (12-1) in a Glendora tournament victory. McKayla Tilton had 11 points for the Tartans, who won their eighth consecutive game. Glendora will play against La Salle today in a semifinal game. Buena Park 45, Rosemead 37 — Sophomore Kathleen Phan scored 12 points for the Panthers (5-9) in an Ontario tournament pool-play loss. Claremont 52, Wilson 34 — Kendra Ukita had 14 points and Miya Yi had 12 points for the Wildcats in an Ontario tournament loss Tuesday. Glendora 2, Arcadia 0 — Alexis Rushlow scored twice and Amy Bishop and Jennifer Segura each had an assist for the Tartans (7-3-1) in a Sunny Hills Classic victory. Rowland 2, Pomona Catholic 0; Rowland 5, Whittier Christian 0 — Ruby Fernandez and Melanie Romero each scored a goal and goalie Viktoria Kozak had a shutout to lead the Raiders to their first-game victory at the Ontario Christian tournament. Melissa Rodriguez scored three goals, Fernandez scored a goal and goalie Kozak had another shutout to lead the Raiders to their second tournament win.